Karen Franco Reyes from Paritilla – winner of the first prize in the Copa Kodu. - The Fund for New World Development, Inc.
Karen Franco Reyes from Paritilla – winner of the first prize in the Copa Kodu. Karen Franco Reyes, a resident of Paritilla, and student at the C.E.B.G. Carlos M. Ballesteros de La Palma school, won the first prize in all of Panama in the Copa Kodu, a software programming competition which took place May 20-21, 2016 in the Convention Center in the City of Knowledge in Panama City. We are all very proud of Karen. Kodu is a program that teaches youth from age 9-15 to use coding to create video games, learning programming skills that will form the base for learning more advanced programming. The games created for the competition are educational and stimulate innovation in the use of the computer. This opportunity was organized and supported by INFOPLAZAS SENACYT Panama and Microsoft. 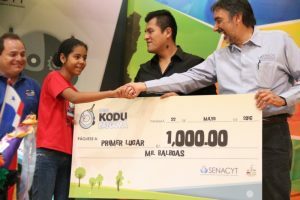 Horacio Prado Duran, Supervisor of the Foundation’s Computer Learning Centers, and Director of the La Laguna Center, and Jesús Antonio Quiroz, Director of the Paritilla Center, taught many students in La Laguna, Paritilla, and Isla Canas how to use Kodu, and provided support for them as they prepared for the regional competition. When Karen won at the regional level, they provided instruction and support for her as she prepared for the national competition. Diana Bennett, a Peace Corps Volunteer also provided invaluable support to Karen and her teachers. Karen was accompanied at the competition by her mother, Sra. Benita Reyes, and by Horacio Prado Duran. Sherwood “Miguel” and Carol Guernsey, Directors of the Fund for New World Development said, “Our heartfelt congratulations to Karen for her incredible victory. We are very proud of her. She has served as an example for many others to follow. “ The Foundation also presented a prize to Karen, at the celebration for Karen in Paritilla. In the United States/ En los Estados Unidos:The Fund for New World Development, Inc.